This lexicon adopts the conventions followed by L.R. Palmer in his ground-breaking work on Linear B, The Interpretation of Mycenaean Greek Texts. Cambridge: Cambridge University Press, © 1963, 1998. ix, 488 pp. ISBN 0-19-813144-5 (1998). For Palmer’s glossary, which follows these conventions, see pp. 402-473. We have adopted these conventions to make the vocabulary of Linear A accessible to any and all, from lay persons not yet familiar with Linear A and non-linguists (somewhat) familiar with Linear B and/or A all the way to professional linguists adept in Linear B, and possibly also in Linear A, in order that everyone, regardless of education or scholastic background may readily access our Linear A Lexicon and come to familiarize him- or herself with at least the rudiments of Linear A, or in the case of professional linguists, with the intricacies of the syllabary. A few months ago I posted my first interpretation of Linear A tablet HT 10 (Haghia Triada). Since then, I have made a few small tweaks. These are (a) the Linear A word kunisu, which is derived from Semitic kunissu, definitely means “emmer wheat”. (b) The supersyllabogram PA stands for Linear A pa3ni (paini) (noun)/pa3nina (painina) (adjective), which means either “millet” or “spelt”, since these two grain crops are the second most common grains cultivated everywhere in the Bronze age after kunisu “emmer wheat” and didero “einkorn wheat”. (c) the translation “offscourings/chaff” for ruma/rumata/rumatase (noun, adjective, noun in the instrumental plural) makes sense in context. (d) dare probably means “with a firebrand or torch”, since the tablet appears to deal with drought, when dead crops, i.e. grains in this case, are burnt. (e) Although tanati resembles the dative singular of the ancient Greek work qa/natoj, but this interpretation is doubtful. Astonishing commentary on my Exhaustive Linear A lexicon, comparing my achievements to those of Albert Einstein! In the past week since I first uploaded my Exhaustive Linear A Lexicon, it has received 410 hits, i.e. downloads, as of 5:00 pm., Monday 7 August 2017. This amounts to almost 60 downloads a day. To download it, click below. You will then be taken to the next page, where you simply click the green DOWNLOAD button. The lexicon has catapulted me from the top 5% to the top 0.1% of academia.edu users. Inspired by your new perspective on one of the most studied cultures in the world. Did the archaic nominative and/or genitive singular feminine ending in ja/ya in Mycenaean Greek derive from the Minoan language? All Linear B entries are drawn Latinized as is from Chris Tselentis’ Linear A Lexicon. ai-ki-a2-ri-jo aigihalios = coastal, of the coast gen.
akorajo= used for communal purposes + for the marketplace gen.
a-pi-no-e-wi-jo ethnic name of Amphinoevioi gen.
arejo = areios (divine epithet)nom. da-wi-jo = ethnic name of Davios gen.
di-ka-ta-jo = Diktaios Cf. Linear A nom. di-u-jo + diwijo = belonging to Zeus gen.
dwo-jo = of two gen.
e-to-ni-jo = etonion = free-hold nom. e-wi-ta-jo = ethnic name of Evitaios nom. ku-te-se-jo = kyteseios = made from ebony gen.
a-ko-ra-ja= used for communal purposes + for the marketplace gen.
a-mo-te-wi-ja armothevia = description of a pot (gen. sing.?)gen. a-ne-moi-ere-ja = priestess of the winds nom. a-ni-ja = ania = reins (neut. pl.) nom. a-pa-ta-wa-ja = ethnic name of Aptarfaia nom. a-ra-ka-te-ja = alakateiai = weavers nom. a-ra-ru-ja = ararya = bound, equipped nom. a-re-ja = areia (divine epithet) nom. da-wi-ja = ethnic name of Davia gen.
di-pi-si-ja = ethnic name of Dipsia gen.
di-u-ja = diyia = priestess of the god Zeus nom. e-qe-si-ja = related to a follower gen.
e-ru-mi-ni-ja = elymniai = roof beams nom. e-to-ki-ja = entoihia = fittings for insertion in walls nom. e-wi-ri-pi-ja = ethnic name of Evripia gen.
i-ni-ja = personal name = Inia nomm. i-pe-me-de-ja = personal name =Iphemedeia nom. ka-da-mi-ja = somee product related to garden cress nom. ka-ki-ja/ka-ke-ja = made of copper = khalkia gen.
ka-pi-ni-ja = kapnia = chimney nom. ke-ra-me-ja = personal name = Kerameia nom. ke-ro-si-ja = geronsia = council of elders nom. + gen.
ko-no-si-ja = Knosia = ethnic name of Knossos gen.
nu-wa-i-ja = numfaia = kind of textile of water-lily colour nom. + gen.
pa-ta-ja = paltaia =  arrow nom. pu-ka-ta-ri-ja = type of cloth nom. qe-ra-si-ja = Kerasia (name of goddess) nom. ra-e-ja = laheia = made of stone gen.
ri-ne-ja = lineiai = flax workers nom. ro-u-si-je-wi-ja = Lousieveia = originating in/from Lousos gen.
si-to-po-ti-ni-ja= sitopotnia = goddess of grain nom. + gen.
te-o-po-ri-ja = Theophoria = religious feast nom. ti-ri-ja= tria = three nom. we-a-re-ja = vealeia = made of glass adjectival + gen.
C: what are all the Minoan Linear A words below ending in ja supposed to represent? Are all or even some of them either nouns or adjectives? Just because they are in Mycenaean Linear B does not constitute proof that they are in Linear A. Nevertheless, they could be. NOTE that it is highly unusual, if not inexplicable, for there to be 57 words with the ultimate ja in Linear A, but none whatsoever ending in jo. This leads me to believe that it is extremely risky to assume that all of these Minoan words with ultimate ja are either nominative or genitive feminine singular. Just because they are in Mycenaean Linear B does not at all necessarily imply that they are so in Linear A. That would be jumping to conclusions. Nevertheless, there may be a case for assuming that Minoan Linear A words with ultimate ja may possibly be either nominative or genitive feminine singular, in which case it would appear that the Mycenaean nominative or genitive feminine singular words with the ultimate ja may possibly be derived from their Minoan precedents. But there is no way of proving this. The last scenario is just as probable as the first two. Here you see Minoan Linear A tablet HT 14 (Haghia Triada), which I have been able to decipher almost completely. This is because the tablet is comprised mostly of ideograms, making it much easier to reconstruct the original text. In addition, I have already translated the supersyllabogram TE = tereza (on the first line) as being a large unit of liquid measurement, which in the case of wine might be something like “a flask”,  “a jug” or something along the lines of  “a gallon”, on the explicit understanding that there was no such thing as a gallon in Minoan times; this is merely an approximation. The supersyllabograms PU & DI are unknown, i.e. indecipherable, at least to date. Likewise, the Old Minoan word, apu2nadu (apunaidu) is also unknown, but it might mean  “harvest”. The units of wheat are probably equivalent to something like a bushel. The supersyllabogram MI = mini signifies  “for a month” (dative) or “monthly”, and is New Minoan, i.e. a word of Mycenaean origin superimposed on Linear A. The rest of the decipherment is self-explanatory. 1. Tablets on which we find only Old Minoan words, or on which the vast majority of words are Old Minoan. These tablets are pretty much indecipherable. 2. Tablets on which we find a combination of Old Minoan and New Minoan (words of Mycenaean origin). The more New Minoan words on a tablet, the more likely we are going to be able to decipher it. Ideally, there should be more New Minoan (Mycenaean) words than Old Minoan (the original Minoan substratum), in order to divine the meanings of Old Minoan words immediately adjacent to New Minoan words. This is of course contextual analysis. Such tablets are at least partially decipherable. 3. Linear A tablets containing ideograms almost exclusively are susceptible to decipherment. HT 14 (Haghia Triada) falls into this category. 4. A very few Linear A tablets are written mostly, almost entirely and in one case only, entirely in New Minoan (the Mycenaean superstratum). These tablets can be be mostly and in some cases entirely deciphered. 2. This possibility is most salient with respect to AI, which might be structured very differently than human intelligence. (pg. 172) ... passim ... It is conceivable that optimal efficiency would be attained by grouping aggregates that roughly match the cognitive architecture of a human mind. It might be the case, for example, that a mathematics module must be tailored to a language module, in order for the three to work together... passim ... There might be niches for complexes that are either less complex (such as individual modules), more complex (such as vast clusters of modules), or of  similar complexity to human minds but with radically different architectures. ... among others respecting the probable advent of superintelligence within the next 20-40 years (2040-2060). This is a revolutionary article you will definitely not want to miss reading, if you are in any substantial way fascinated by the application of supercomputers and preeminently, quantum computers, which excel at lightning speed pattern recognition, which they can do so across templates of patterns in the same domain, to the decipherment of Minoan Linear A, an advanced technological endeavour which satisfies these scientific criteria. In the case of pattern recognition across multiple languages, ancient and modern, in other words in cross-comparative multi-language analysis, the astonishing capacity of quantum computers to perform this operation in mere seconds is an exceptional windfall we simply cannot afford not to take full advantage of. Surely quantum computers’ mind-boggling lightning speed capacity to perform such cross-comparative multi-linguistic analysis is a boon beyond our wildest expectations. 6 more Minoan Linear A putative proto-Greek or proto-Mycenaean words: DA-DI. But are they proto-Greek at all? As we forge our way through Prof. John G. Younger’s Reverse Linear A Lexicon, in which he Latinizes the orthography of Minoan Linear A words,  we now arrive at Linear A words beginning with the syllabograms DA through to DI. It is absolutely de rigueur to read the Notes in the table above; otherwise, my tentative decipherments of 6 more Minoan words in Linear A as being possibly proto-Greek or proto-Mycenaean will not make any sense at all. The table also draws attention to those words which are of moderate frequency (MF) on Minoan Linear A tablets and fragments, with the far greater proportion of them appearing on mere fragments. I cannot emphasize this point enough. In view of the fact that the vast majority of Minoan Linear A extant remnants are just that, remnants or fragments and nothing more, it is of course next to impossible to verify whether or not the 6 words I have extrapolated (or for that matter any other so-called proto-Greek words)  as possibly being  proto-Greek or proto-Mycenaean are that at all. dépas ‘cup; pot, vessel’, Mycenaean di-pa, from the Luwian = tipa = sky, bowl or cup, one of the pre-Greek substratum words right in the table above! + mólybdos ‘lead’, Mycenaean mo-ri-wo-do, from Lydian mariwda(s)k ‘the dark ones’ etc. has this to say about Greek vocabulary. Greek is a language distinguished by an extensive vocabulary. Most of the vocabulary of Ancient Greek was inherited, but it includes a number of borrowings from the languages of the populations that inhabited Greece before the arrival of Proto-Greeks. (italics mine)  Words of non-Indo-European origin can be traced into Greek from as early as Mycenaean times; they include a large number of Greek toponyms. Pre-Greek substratum words are both proto-Greek and not, simultaneously! The assumption that certain Minoan words in Linear A appear to be proto-Greek or even proto-Mycenaean (if we wish to stretch the notion one small step further, which I believe is entirely justified) does not in and of itself necessarily imply that some or even quite possibly most of them are de facto actually of proto-Indo-European proto-Greek origin, when quite plainly (so) many of them are not of such origin. In other words, we find ourselves face to face with an apparent contradiction in terms, a dye-in-the-wool linguistic paradox: some, many or even most of the so-called pre- + proto-Greek words we encounter in Minoan Linear A are likely to be proto-Greek, but only insofar as they crop up again and again in later ancient Greek dialects, right on down from the earliest East Greek dialect, Mycenaean, through Arcado-Cypriot on down to Ionic and Attic Greek and beyond, while simultaneously being of non-Indo-european origin, if you can wrap your head around that notion... which I most definitely can. So if anyone dares claim that all of those words in Minoan (of which there seem to be quite a substantial number) are de facto proto-Greek, that person should think again. Think before you leap. It is much too easy for us to jump to spurious conclusions with respect to the supposed proto-Greek origin(s) of many words in Minoan Linear A. To compound the matter further, let us consider the situation from the opposite end of the spectrum. It is widely known, by both intellectual non-linguists, i.e. intelligent native speakers of any given language, and by professional linguists alike, that pretty much every modern language borrows not just thousands, but tens of thousands and even hundreds of thousands of words from prior languages. The one modern language which exemplifies this phenomenon par excellence is non other than English, in which we find hundreds of thousands of loanwords from ancient Greek, Latin and Norman French. Now if even most of the so-called Mycenaean Greek terms listed here are actually Minoan, then it is stands to reason that Mycenaean Greek inherited them from the Minoan language itself, and ergo, that they are not necessarily proto-Greek words at all. It is as if we were in a flip-flop. Either way, whether or not any of the words which we have flagged (and shall continue to tag) as possibly being proto-Greek in the Minoan language or the other way around, whether or not certain words in Mycenaean Greek are not proto-Greek at all, and not even of proto-Indo-European origin, we find ourselves floundering in a Saragossa Sea of linguistic incertitude from which we really cannot extricate ourselves. So to all those researchers, past and present, into the Minoan language who make the claim, categorical or not, that much of the vocabulary of the Minoan language is proto-Greek, I say “Beware!” lest you fall into a trap from which you cannot reasonably hope to extricate yourselves. Are there “adjuncts” a.k.a. Supersyllabograms in Minoan Linear A? Apparently so… at least in the pottery and vessels sector of the Minoan economy. But what do they mean? Are there “adjuncts” a.k.a. Supersyllabograms in Minoan Linear A? Apparently so... at least in the pottery and vessels sector of the Minoan economy. But what do they mean? Without our delving nto details re. 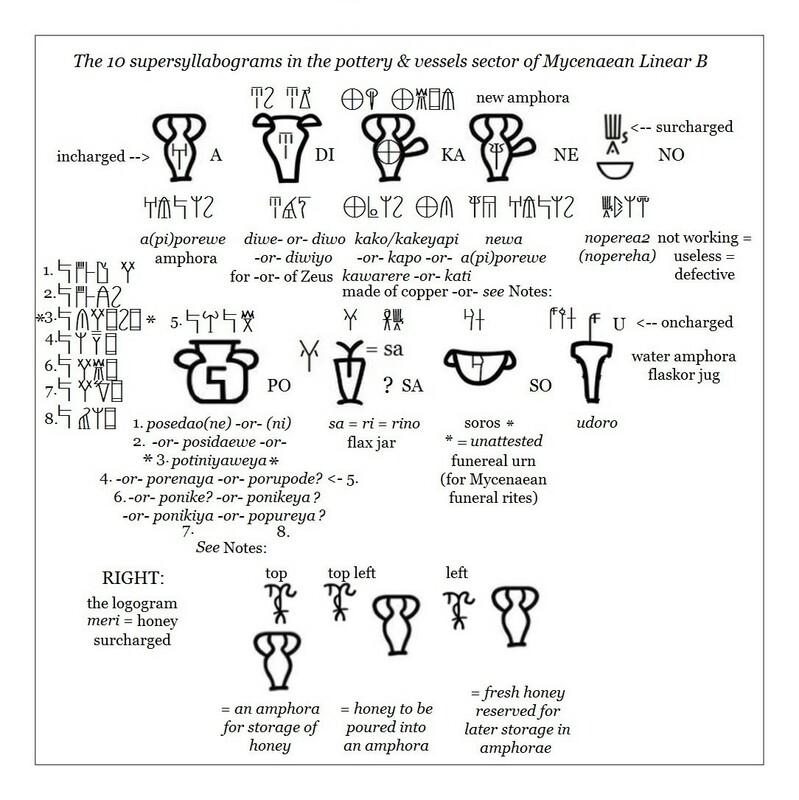 the specific meaning of each and every one of these 10 supersyllabograms out of a total of 35 which I have discovered to date in all sectors of the  Minoan-Mycenaean economy, we can still see that each one clearly delimits the actual type of vessel with which the incharged supersyllabogram is concerned. For instance, the syllabogram di incharged in the ideogram for a two-handled kylix indicates that this is a libation vessel either to Poseidon or Potnia, two major Minoan/Mycenaean gods, whole so incharged in its vessel would in all probability indicates that this is a funerary urn. we at once see that it too contains a total of 6 syllabograms, all of which are incharged in the ideograms for pottery or vessels which they represent. By “incharged” I mean that the supersyllabogram is bound inside the ideogram with which it is associated. In Mycenaean Linear B at least, all incharged supersyllabograms without exception are attributive, that is to say, they describe an actual (adjectival) attribute of the ideogram within which they are found. The question is, what do they mean? In other words, (a) how does each of these incharged syllabograms delimit the vessel they are attributes of to one and one only specific type of vessel? This leads us directly to the next obvious question, (b) what can each of these incharged supersyllabograms mean? Can we glean from each of them the actual meaning, i.e. the type of vessel with which they are concerned? — because if there is even a chance that we can, then we shall have discovered for the first time ever the actual meanings of  a possible maximum of 6 Minoan words, and that would constitute a breakthrough, however minimal, in the decipherment of the Minoan language, which has to date resisted all attempts whatsoever at decipherment. Two of the characters, 2 and 5 on this tablet may not be Linear A syllabograms. I am unable to identify them as such. 1 appears to be the syllabogram su, but I cannot be sure. 3 is definitely the syllabogram for the vowel u, while 4 appears to be that for po. 6 is definitely the syllabogram for  the vowel a. 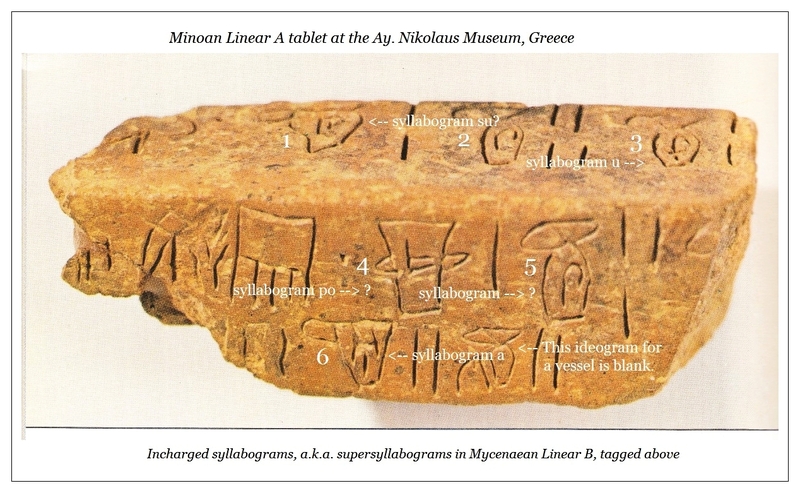 Even though this syllabogram clearly signifies an amphora in Mycenaean Linear B, no such conclusion can be safely drawn for Minoan Linear A, since the language is not Greek — unless the word for amphora is pre-Greek, which is highly unlikely. But the question remains, what kinds of vessels do the Minoan syllabograms su & po (which are tentative on this tablet), and u and a, which are certain, signify? With reference to the so-called certainty of the syllabograms a in u in Minoan Linear A, we of course have to rely on the premise that all or at least the vast majority of syllabograms in Minoan Linear A are either  identical or nearly identical to their Mycenaean Linear B counterparts. But unfortunately even that is not so certain, although most linguists and researchers into Minoan Linear A believe this to be the case. For the sake of uniformity and consistence with the prevailing views on the actual phonemic value of each Minoan Linear A syllabogram, let us assume this is the case. If this scenario is indeed tenable, I propose in the next 3 posts to unravel the putative meanings of a maximum of 4 types of vessels as found on the Minoan Linear A tablet illustrated above, down to a minimum of one, the word for “tripod” in Linear A, perhaps the only one for which the definition would appear to be sound.